The new building will be WuXi’s fourth at the Navy Yard, making it Liberty’s largest tenant in the urban campus. 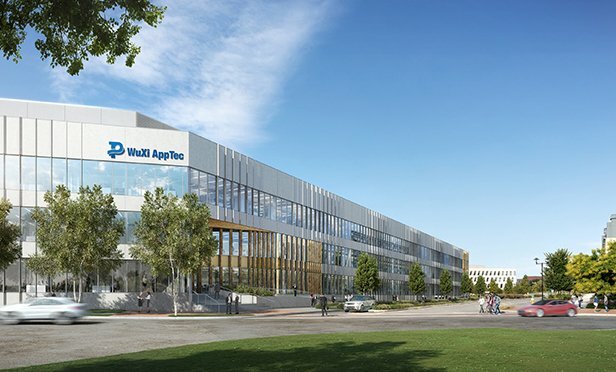 PHILADELPHIA, PA—Liberty Property Trust and Synterra Partners will begin construction early next month on a 95,000 square foot build-­‐to-­‐suit office and laboratory building for WuXi AppTec’s Advanced Therapies Business Unit at the Navy Yard. The new facility, at 400 Rouse Boulevard, designed to achieve LEED® certification, will be WuXi ATU’s fourth building at the Navy Yard and the third build-­‐to-­‐suit developed by Liberty for the company. When the new building is completed in late 2019, WuXi ATU will become Liberty’s largest tenant in the campus, occupying more than 380,000 square feet of space.